This original "Caged" Ceiling Light is our re-interpretation of a traditional Victorian bird aviary. Suspended on a metal rod, the frame charmingly encaptures a silk lampshade of your choice, which incorporates a lucite bottom diffuser. It is not only available in four hand painted finishes, but we also offer a choice of two metal textures - Smooth or Hammered. The Drum shade is included and can be ordered in any of our 280 silks and satins, whilst the central rod can be specified in any length. 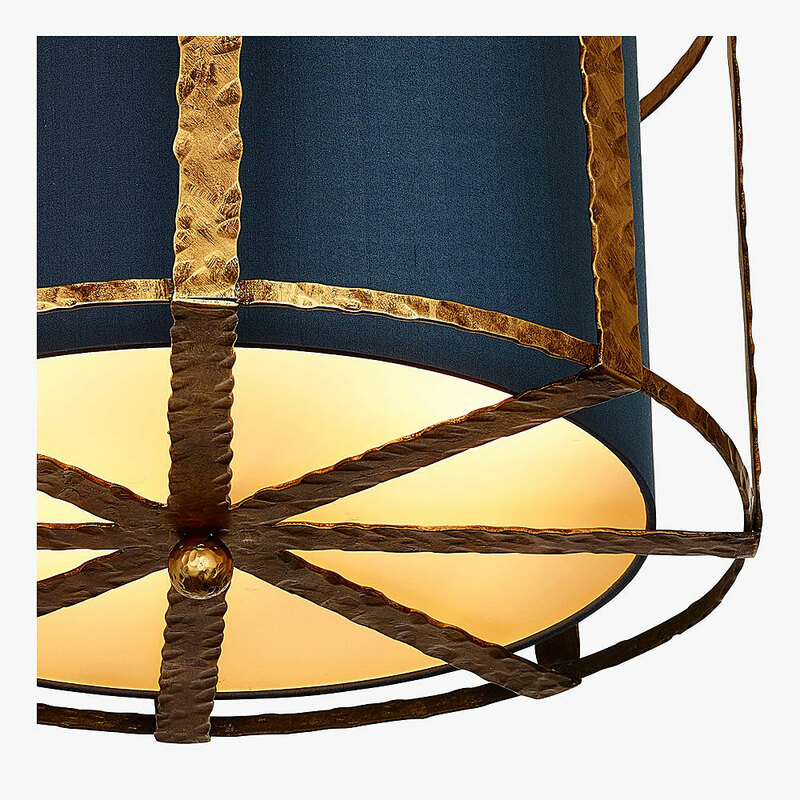 This versatile chandelier can also be ordered in custom sizes. Overall height with a minimum 20cm of central rod and ceiling rose 52cm - 20.5". The central rod can be ordered as standard in any overall height of up to 100cm - 39". If a greater overall height is required, please contact us. Shades can be supplied with all global ﬁttings - BC, ES or ﬁnial ﬁtting. Please note that you have already selected five cuttings. Whilst we are happy to provide up to five cuttings free of charge, this is limited to a maximum of five. All content and images © Bella-Figura Ltd. Please enter the details below and click subscribe. I'd like to be contacted by Bella Figura with news and updates on products and offers.